We are the longest operating outfitter in Nunavut offering the very finest in polar bear, muskox, caribou, barren-ground grizzly bear and Atlantic walrus hunts. We started polar bear hunting in the High Arctic in 1981 and have maintained virtually a 100% hunting success rate throughout its operation. You will experience breathtaking vistas in a pristine Arctic environment while immersed in an Inuit culture that has evolved over 4,000 years. 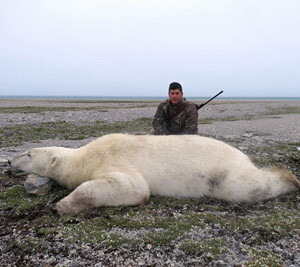 Hunting takes place along well-known polar bear summer and fall shoreline retreats within prime locations. Accommodations during the hunt are in basic plywood cabins or canvas tents when necessary. The fall polar bear hunt package consists of 8 full days plus 2 round-trip travel days to and from the hunting area. This is a spot and stalk 1×1 hunt with the use of side-by-side ATV’s for transportation. An assistant guide is provided for additional support and safety. The hunt is considered over when a polar bear is harvested, even if this occurs in the first day or two. $ 9,950.00 USD – Non-hunting companion with guide and transportation. August 25 to November 7 – Exact starting dates are negotiable with Arctic air travel flight schedules taken into consideration, and are covered in each client’s hunting contract.